Sharing fruit between fruit owners, volunteer pickers and community organizations. We know that tree fruits, nuts, and berries are a major attractant for bears in Revelstoke. Help us keep the bears wild and our community safe – while at the same time sharing your bounty! Become part of our Gleaning Project. You can offer fruit or become a volunteer harvester. Find your own fruit pickers. Take your excess fruit to those that need it. Offer your tree for adoption. Our coordinator, our tree scouts, and home-owners decide together the best time to schedule a harvest party. Volunteers arrive to pick the fruit at a pre-arranged time. 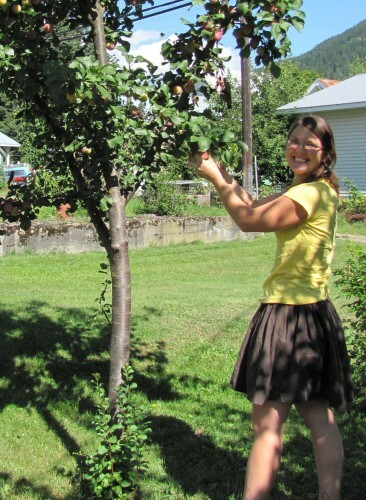 Harvested fruit is shared between homeowners, volunteers, and community agencies such as the Community Connections Food Bank and Food Recovery Program. Bears will return to the same tree year after year. 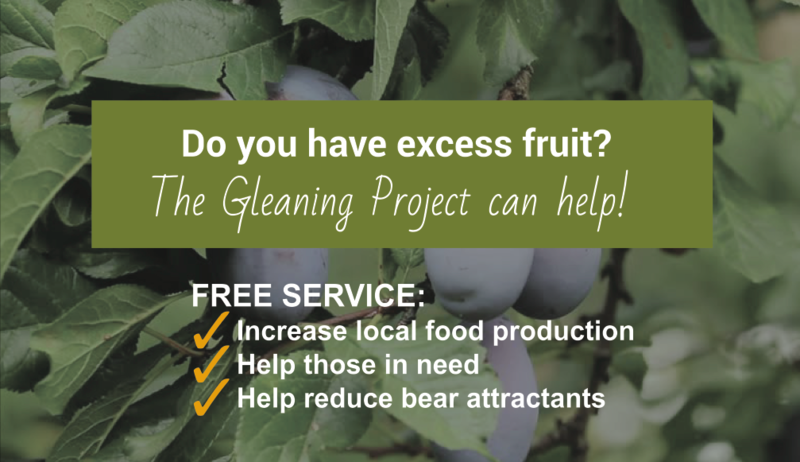 The Gleaning Project gathers surplus fruits and vegetables from our community, helping to reduce bear attractants. 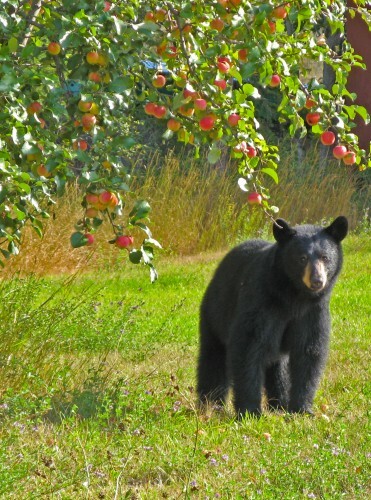 Residents with excess fruit can contact Revelstoke Bear Aware to arrange volunteers to harvest the fruit. The volunteers receive some of the fruit and the remaining fruit is donated to Community Connections Food Bank. The project also invites all residents to donate their extra fruit, berries, and vegetables directly to Community Connections Food Bank. Helping our community reduce the amount of fruit available to bears conforms with the City of Revelstoke’s Garbage Collection and Wildlife Attractant Bylaw #2178 and the BC Wildlife Act section 33.1. Volunteer to pick! Contact Revelstoke Bear Aware at 250-837-8624‬‬ or enter your email address below. Our gleaning coordinator will be in touch to get you to sign our waiver and make sure you are clear on how the harvesting is done. Become a Tree Scout! Contact Revelstoke Bear Aware at 250-837-8624 to find out about helping us locate new trees or monitor registered fruit trees. Please read the gleaning etiquette and FAQ below, before you commit to volunteering or offering your tree to volunteers. Our program works! For example, in 2017, Community Connections Food Bank was pleased to receive 1800 pounds of cherries, plums and apples from The Gleaning Project. Community Connections Food Bank also saw an increase in the amount of fruit that was being donated, outside of The Gleaning Project. It’s far easier to manage and pick fruit from a tree that has been pruned, not to mention how much better the quality of fruit will be. If you’re looking to prune the tree yourself keep an eye out for our pruning workshops on Facebook. Pruning workshops are sponsored by Loki Tree Services. Contact Loki Tree Services to have them prune the tree for you. Join the Revelstoke Fruit Share Facebook community to list your fruit and ask for help. This online community is a place to connect with fellow fruit lovers. It’s up to you to contact people and follow through with arrangements. I’ve picked my fruit, but can’t use it all – what can I do with it? Use your own social media account or Revelstoke Fruit Share Facebook community. to let others know that you have picked fruit to give away. If your fruit is in poor condition, take it to the landfill or bag it for collection on your garbage day. Volunteers picking fruit discourages downtown bears. This is a long-term option for better management of your fruit tree. We can facilitate the adoption of fruit trees by providing introductions between those who have a fruit tree they don’t want deal with, and those who would like to manage and harvest a fruit tree. Management usually consists of some pruning in late fall or early spring, and then harvesting the fruit. The conditions of the adoption are determined by the adopter and adoptee and may be made to suit both parties. It’s up to you to keep up the management and the relationship. We do not want people showing up randomly to someone’s home. And it’s so much nicer to work on the fruit together! Bring your friends/family/kids! The more the merrier. Your kids will need your supervision due to the ladder work. Please leave your furry family at home. Ensure the fruit is harvested and shared safely and respectfully. Always be respectful of the fruit owner’s property and the instructions they provide for the harvest. Non-edible fruit gets donated to local pig farmers or composted. Take a photo if possible and submit to gleaning@revelstokebearaware.org. Leave the site as neat or neater than before you arrived. Be safe! No fruit is worth risking injury. Do NOT climb on fences, garages, sheds or other objects on the fruit owners property (or their neighbours’). Do pick in light rain. Sing. Do NOT pick when there is lightening or thunder. Be cautious of slippery surfaces (i.e. ladders rungs, tree branches). Do NOT pick if you feel unsafe for any reason! We are extremely proud of our volunteers and the care and respect they show fruit owners’ property and fruit. We also care about them a great deal and instruct them to be safe and avoid taking unnecessary risks. Please understand that sometimes, this means that parts of a fruit tree may not be able to be picked (e.g. if the fruit hangs over a delicate structure or the fruit is higher than can be safely reached with a ladder, etc.). Pruning your tree is very helpful for our volunteers. Please be sure your pets are indoors while your fruit is being picked. Registering your fruit tree so we can send someone to pick for you? Volunteering as a fruit picker? Putting your tree up for adoption? Become part of the Gleaning Project and contact Revelstoke Bear Aware at 250-837-8624‬‬ or enter your email below. Are you interested in volunteering for the Gleaning Project as a fruit picker? Enter your email today and we’ll be in touch on the next gleaning day.